Woot! I’m done! 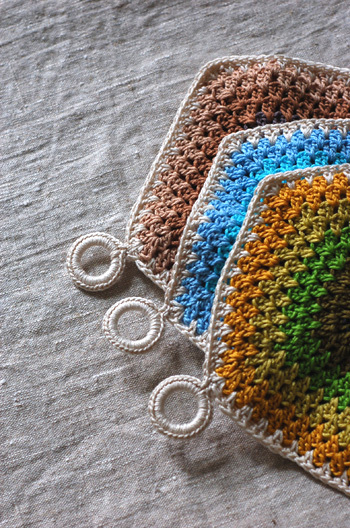 Between practicing my crochet and trying to settle on a pattern for the swap, I must have made 10 potholders, so when it came time to do my 5, I was kind of sick of them. Great behavior for one of the hosts, right? It turns out this pattern is super fun and I started a 6th last night, just because there was one more color combination that I needed to do. Verdict: AWESOME! This is a totally simple pattern that lends itself to stripes and fun color combinations. 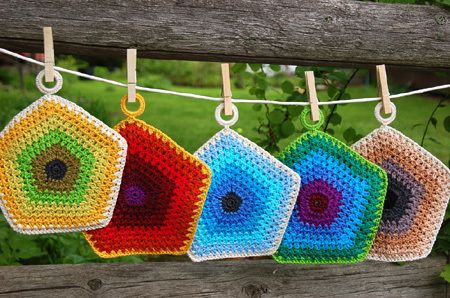 These potholders have 2 identical sides and are crocheted together on the last round. White plastic drapery rings are used for the loops. When I got to the end of the joining/ last round, I did single crochet around the plastic rings and slip stitched through the first stitch. These are heavy duty potholders. There’s no chance a finger could poke through and be burned. These were very wonky until they had a visit from a steam iron. Don’t freak out if you make them and they won’t stay flat. Give them a good smushing with an iron. Toddy coffee: I’ve been making mine in a 1/2 gallon jar, straining through first a regular mesh strainer to get out the big bits, then through a fine tea strainer back into the original, now washed, jar. We drinking it iced, 1:1 with vanilla soy milk. I can’t believe it took me so long to try this. It’s excellent! Mimobot mimoShroom: My new project is going to be to put all of my recipes into this little flash drive, rather than printing out recipes from the internet. Since getting a Dell Mini 9, it’s been super easy to cook from a recipe on the screen. MASW: I’ll be at the Massachusetts Sheep and Woolcraft Fair both days this weekend, shopping, visiting, and helping out AmyBoogie/Spunky Eclectic at her booth. I won’t be selling there, just visiting. Say hi!